You can add the VF2, giving you one of the best electronic viewfinders on the market. 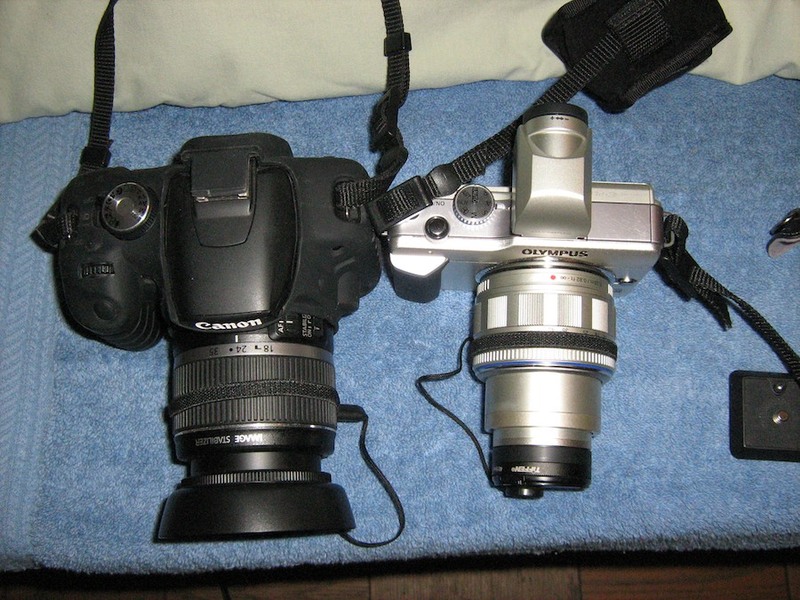 Here is a good idea how compact the epl1 with the kit lens and vf2 viewfinder is next to my canon T1i. My wife has small hands, and the epl-1 is very easy for her to handle. The EPL1 is *about* the same height and width as the E620. But, it is quite a bit thinner and has no EVR. my question is, if I have to buy a viewfinder for EPL-1 and then a second lens, then it will be almost as expensive as e-620 with two lenses and a decent flash, or even more expensive. or maybe I am mistaken. Yeah, it is more expensive. But there is a cost for compactness. But the wonders of a more modular system is you can get things later not all at once. It also bears mentioning that while T1i is larger, it's also really lightweight. Everyone complains about how much plastic is in it, but this does have its advantage. I hope OP will have a chance to handle some of these cameras in person before deciding on one. I would recommend the Pentax K-x with the 2 kit lens, 18-55 & 55-300.Best entry level low light performance camera.V well reviewed camera.Should fit your price range. Last edited by Fayyaz; Nov 20, 2010 at 5:26 PM. I was in a shop today, and I happened to see a lot of cameras...I didn't like the little compact like format of EPL1, and to my surprise I didn't like the grip of olympus e-450 either. I didn't see e-620, but as I read it is much like e-450. I just couldn't hold them in a stable way in my hand. I very much liked the grip and format of D3100 though. I really liked it. And yes, I am going to shoot mostly JPEG, will there be a problem with D3100 while shooting JPEG? I also tried sony alpha a33, it was a really nice camera, I have to say. the nikon and sony will need more editing to get the photos better. Olympus is the only one the will give you jpegs right out of camera at are great. The A33 is not a bad camera. HD does overheat the camera if you take a long video clip. And the battery does not take allot of photos between recharge. But it can use all the sony lenses. The d3100 is not a bad camera. But if you want a low cost big aperture lens for portrait like a 50mm it will cost you 450 dollars. While the canon and sony one are 95 and 120 dollars. But if you do take photos in tricky lighting not being able to take a EV bracket is a disadvantage. 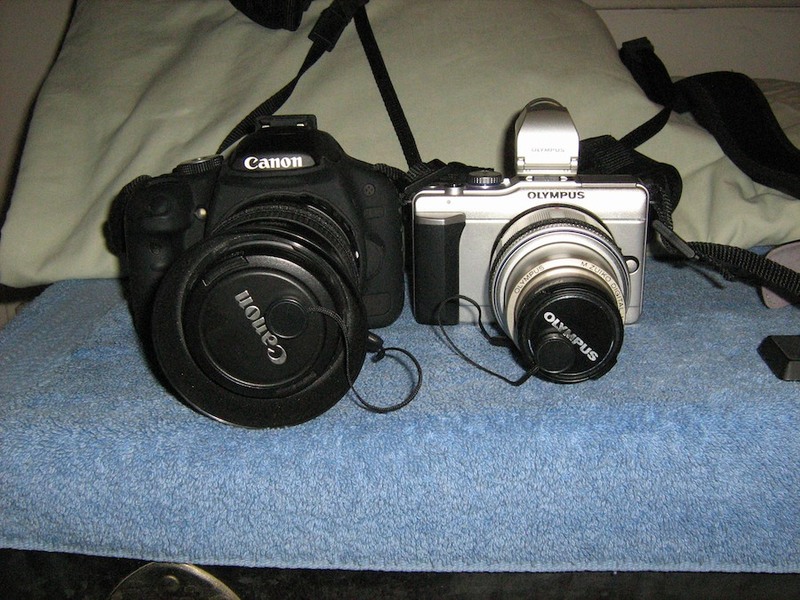 Did you try the canon 500D or the Pentax's? Last edited by shoturtle; Nov 20, 2010 at 6:38 PM. How did the camera handle for you?